On the welcome page I already referred to the MP40 as an efficient instrument of war. I'm a 100% sure that the designers also had this in mind when they were shaping the "Maschinenpistole". Apart of the functionality the MP38 and MP40 had to reflect the modern efficiency and the power of the National Socialistic "Blitzkrieg". 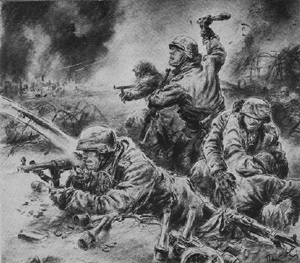 You have to realize that there was no army in the world that could be compared with the "German Wehrmacht" of 1939. The MP38 and MP40 were powerful examples. The National Socialistic officials, responsible for the propaganda of the "Third Reich", were off course well aware of this fact and used this in their communication to the public. Again; note that with these pictures, in no way, I want to glorify the National Socialistic system. I reorganised this page slightly and made subpages. To the left you will find the links to these pages. 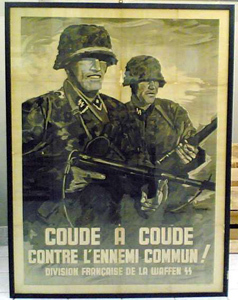 Coude a coude contre lénnemi commun! If you have any pictures of poster, flyers etc. Please send them to me at: info@mp40.nl and I will add them to this page.